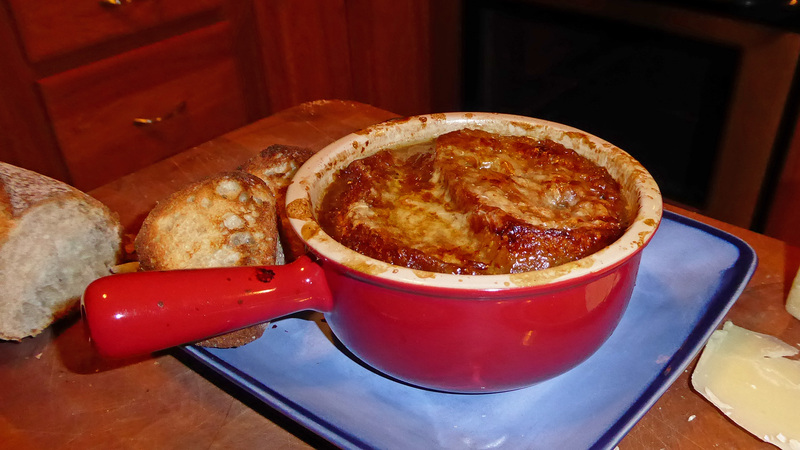 On Sunday, I made a double recipe, five quarts, of Julia Child’s French onion soup – The Way to Cook variation – in preparation for my hybrid French onion pot roast beef stew on Christmas. This variation of hers is my favourite. The cognac and vermouth insinuate themselves delightfully into the soup during the three-hour slow simmer, producing intricately complex flavours in the result. So, I signed up for a new blade and proceeded to thinly slice nineteen onions without mechanical aid. I briefly considered using the mandoline, but using that thing for the better part of an hour seemed like it might well be the start of an eventually disappointing recipe for a trip to A&E, never convenient when you’re about to caramelise twenty cups of onions for an hour or so. ’Round about onion seventeen, I did poke my thumb with the tip of the knife, the first time in some years I’ve cut myself (“Say…why is this onion running red?” I idly wondered), but the Victorinox is nice and sharp, so it was at least a clean cut. Of course, the soup cannot just lazily sit in the fridge waiting for Saturday night. Quality testing protocols must be followed here at the Finley Quality Network, and that’s where I come in. I also happen to be the sole employee, but that’s neither here nor there – we (I) have standards to maintain regardless of piffling staffing levels. Plus I needed dinner. As may be obvious from the photograph, yes, it passed with flying colours. 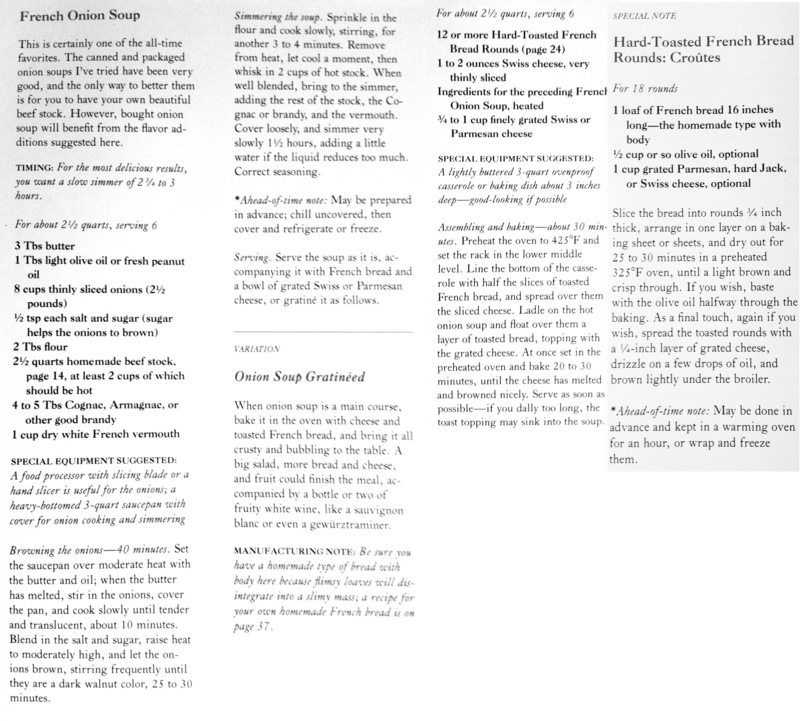 If this has piqued your interest, here’s a printable image I put together of the three related recipes from The Way to Cook: the soup, the French bread croûtes, and the gratinée variant. On Amazon, I found the defective processor blade, used on about twenty models over a nineteen-year period, is still being offered for sale. As if that wasn’t bad enough, my eyebrows like to shoot off the top of my head when I then, out of curiosity, looked at the oldest reviews and found one in 2012 clearly describing a metal fatigue problem in the blade. I don’t wish to cast aspersions or, more specifically, get sued, but I certainly hope Conair hasn’t been sitting on any similar information they might have been privy to. In the midst of reading As Always: The Letters of Julia Child and Avis DeVoto by Joan Reardon, and while separately reading of Mark Twain’s two-week experience as an amateur and eventually too-reluctant Confederate soldier, I discovered an interesting connection. Avis DeVoto’s husband, Bernard DeVoto, had written an article in Harper’s on the difficulty of finding good kitchen knives in the US – this was in the early 1950s. That article is what prompted Julia to write; he was fairly busy at the time, so his wife answered instead with a four-page letter. Thus began a long correspondence and friendship, and something else that was momentous. 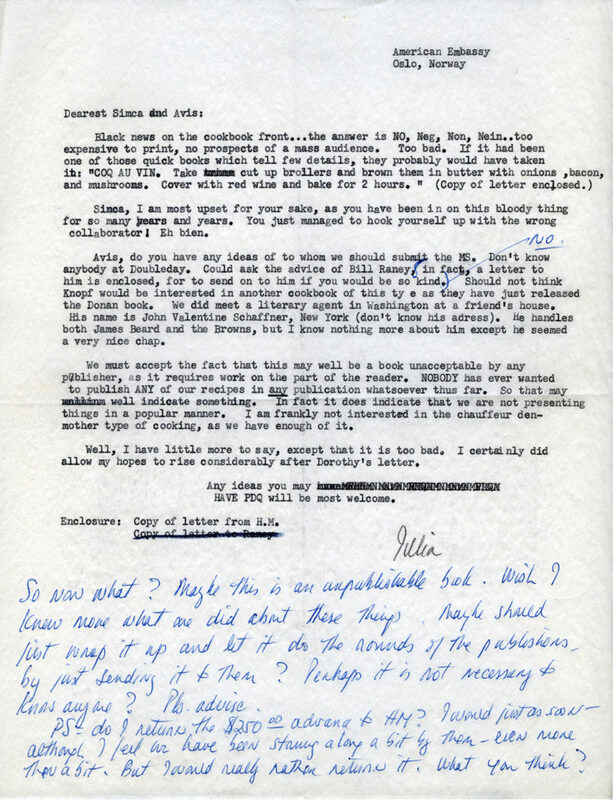 Avis had connections in the publishing world that eventually led to the release of Mastering the Art of French Cooking by Knopf in 1961, nine years after Julia and Avis first exchanged letters in 1952. The unusual connection I wasn’t aware of until just now – or, rather, for which I hadn’t yet connected the dots – is that Bernard, a historian, was an authority on Mark Twain who curated and edited Twain’s papers. He edited a few books of Twain’s work, including the still in print The Portable Mark Twain, one of the first Twain volumes I read many years ago. Before I knew of the Child connection, I only recently bought DeVoto’s Mark Twain’s America, originally published in 1932, to get a better sense of what the country was like at the times of Twain’s travels. They came to Virginia City as soon as the true value of the Comstock was perceived. They constituted, no doubt, a deplorable source of gambling, pleasure and embroilment. They were not soft-spoken women, their desire was not visibly separate from the main chance, and they would have beheld Mr. Harte’s portrayal of them at Poker Flat with ribald mirth. But let them have a moment of respect. They civilized the Comstock. They drove through its streets reclining in lacquered broughams, displaying to male eyes fashions as close to Paris as any then current in New York. They were, in brick houses hung with tapestries, a glamour and a romance, after the superheated caverns of the mines. They enforced a code of behavior: one might be a hard-rock man outside their curtains but in their presence one was punctilious or one was hustled away. They brought Parisian cooking to the sagebrush of Sun Mountain and they taught the West to distinguish between tarantula juice* and the bouquet of wines. An elegy for their passing. The West has neglected to mention them in bronze and its genealogies avoid comment on their marriages, conspicuous or obscure, but it owes them a here acknowledged debt for civilization. They’re a rarity in Massachusetts, especially since Blood Farm’s fire last December, though the Blood family are nearly done rebuilding the combined smokehouse, processing, and retail building that was lost. At a Groton town meeting the other day, Elliot Blood said they’re planning a “soft” opening around the end of this month – meaning a grand reopening event is also in the works, I imagine. There’s a place equidistant from my house that claims to be a butcher shop. It’s not. When they opened several years ago I went in there twice, once shortly after they opened to be disappointed and the second time a few months later – to see if they were still as dismal, not because I’m a glutton for punishment. They were. Anyway, it sounds like I should be able to get one of Blood Farm’s delightful smoked hams for Christmas again this year. 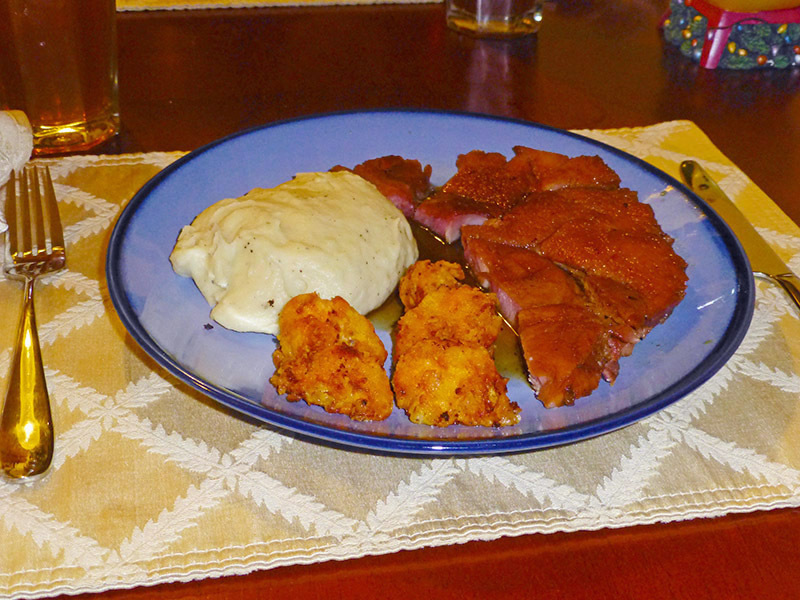 Here’s last Christmas’s cider-baked ham with deep-fried cauliflower and Julia Child’s Purée de Pommes de Terre à L’ail – that is, garlic mash, from Mastering the Art of French Cooking, Vol. 1, recipe at the end of this post. To me, there’s nothing better than raw garlic if you’re looking to ruin a batch of perfectly mashed potatoes, but slow-braising the garlic in butter first provides the perfect mellowing. In the meantime, I may visit Fairway Beef, which I recently found mentioned in an eGullet thread. It’s about 30 minutes from my office and sounds like my kinda place. Who knows, I might even be able to get some of the specialised cuts I can order at Blood Farm, though I strongly doubt Fairway sells goat or has bacon smoked over the other side of the building. Two whole heads of garlic will seem like a horrifying amount if you have not made this type of recipe before. But if less is used, you will regret it, for the long cooking of the garlic removes all of its harsh strength, leaving just a pleasant flavor. Garlic mashed potatoes go with roast lamb, pork, goose, or sausages. Although both garlic sauce and potatoes may be cooked in advance, they should be combined only at the last minute; the completed purée loses its nice consistency if it sits too long over heat. Separate the garlic cloves. Drop into boiling water, and boil 2 minutes. Drain. Peel. Cook the garlic slowly — low heat — with the butter in the covered saucepan for about 20 minutes or until very tender but not browned. A hot, lightly buttered vegetable dish. Shortly before serving, beat the hot garlic sauce vigorously into the hot potatoes. Beat in the cream by spoonfuls but do not thin out the purée too much. Beat in the parsley. Correct seasoning. Turn into hot vegetable dish. 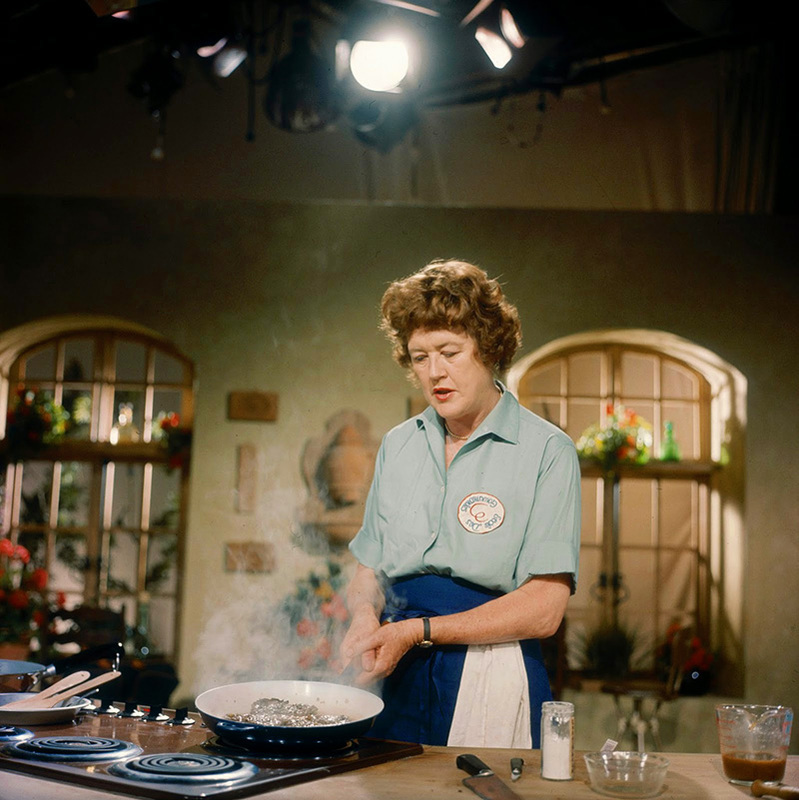 It’s been just over ten years since Julia Child left us here to cope with a planet made considerably poorer by the lack of Julia Child. I owe a lot to her. She’s responsible for my love of cooking and baking, not to mention at least some of my attitude toward life, more probably a large part. She had such a lively disposition, and a devilish habit of speaking her mind regardless of whether there might be consequences. She wasn’t snarky, she was impish. She was – and is – my hero. 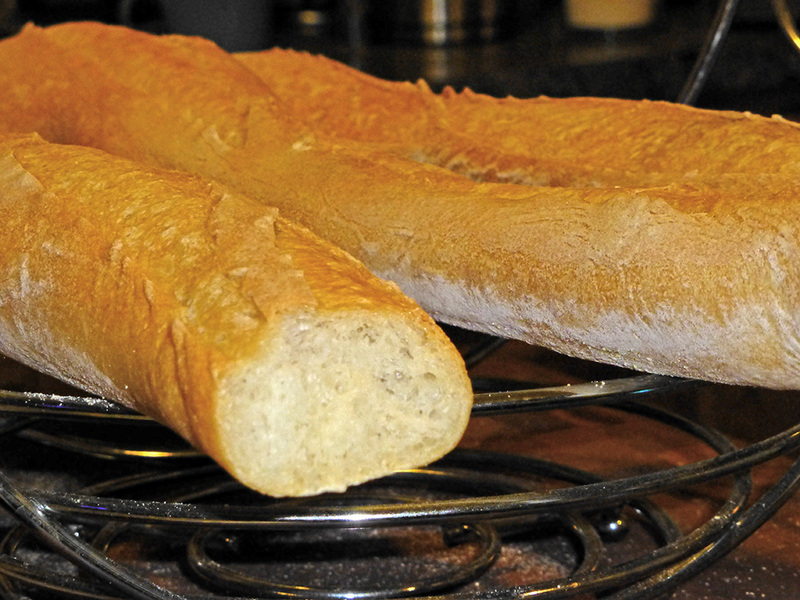 The episode that really set itself firmly in my memory was when she made traditional French bread. 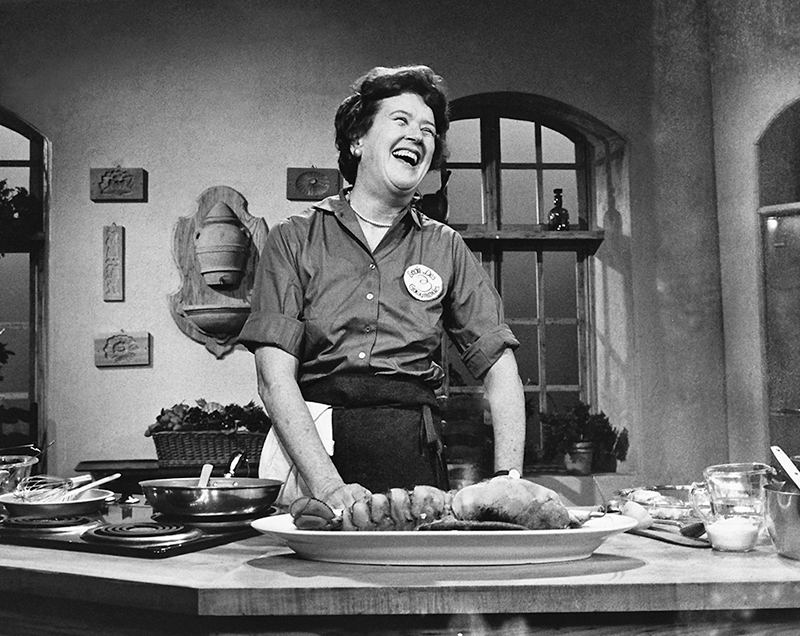 When kneading, she would slam the dough onto the counter, raising great clouds of flour and clearly having a ball. 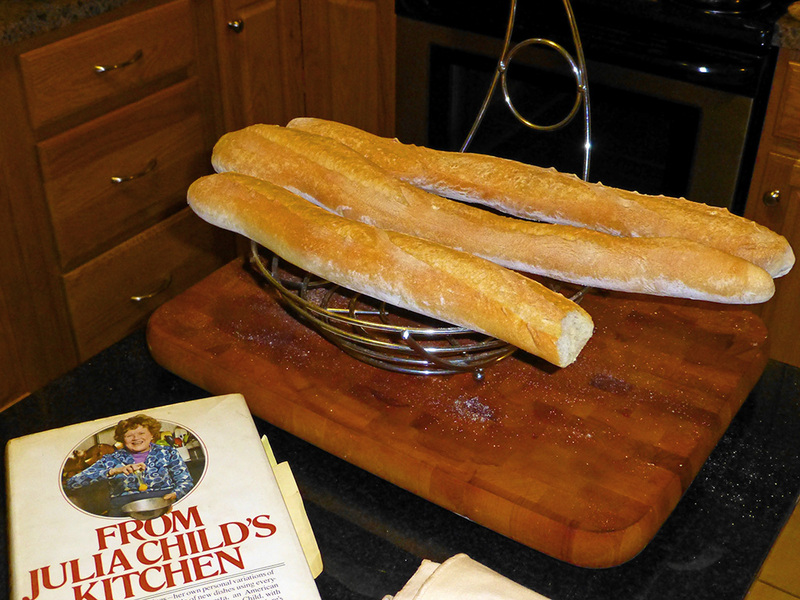 When I did finally start making food for myself years later, that bread was what I remembered, and my first baking project was baguettes, using her detailed instructions in From Julia Child’s Kitchen, the first cookbook I ever owned. That they came out fantastically well guaranteed that I’d never stop, thank goodness. Had I failed miserably at that first attempt, there would be a more than middling chance that my life would be at least an order of magnitude poorer now. I didn’t fail because that’s how good she was at teaching and encouraging novices. In years past, I saw her more than once just off Harvard Square, at the Church Street car park. Each time, I would wave and give a cheery hello, and she did the same. I never had one of her cookbooks with me, but I later wrote a letter of thanks to her and asked if she would sign my copy of The Way to Cook, which I included along with a postpaid box with which to return it. She did, and it is a treasured volume. I miss her often. Whenever I do, I watch a few of the hundreds of hours of her shows that I have. She brings a smile every time. A new rose was bred in 2004 and named after Julia Child. It is, of course, the colour of butter. A really good butter. She would have no less.